This web site is dedicated to my family members and to all those who served during World War II to rid the world of tyranny and oppression. This is my tribute to them. On Memorial Day weekend 2000 my family had reunited for my sister�s long anticipated wedding. All of my relatives were visiting my family in Virginia Beach. On Sunday my Uncle Rainey Grenier and his wife Barbara were over our house for a barbecue. The weather was lousy, it had rained all weekend long. So we had dinner inside the house. After dinner, my Uncle, my father, and myself were sitting around the breakfast bar. The conversation drifted to the military due to my active duty service. I don�t remember exactly how it all started but the discussion focused on Rolland Despres and our other two uncles: Leo and Freddie Dionne, who I didn�t even know. The conversation focused on what they all did during World War II. Neither my father nor my Uncle Rainey knew what units the men were in during the war all they knew is that Rolland landed in Normandy, Freddie was in the Army, and Leo in the Navy. Before I knew it I had volunteered to research the men and find out what units they were with. As I started gathering information on Rolland, Freddie and Leo I was asked about other relatives that had served during the war and relatives that served during the Cold War. Soon, I had collected so much information I had nowhere to put it. 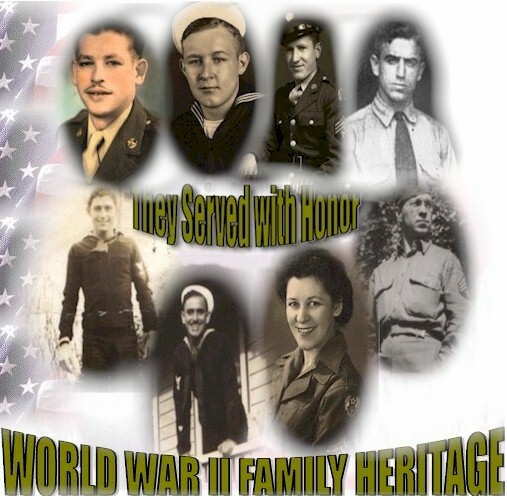 So, what started out as research on three men's military units, quickly blossomed into a family wide genealogy research project. "At a time in their lives when their days and nights should have been filled with innocent adventure, love, and the lessons of the workaday world, they were fighting in the most primitive conditions possible across the bloodied landscape of France, Belgium, Italy, Austria, and the coral islands of the Pacific. They answered the call to save the world from the two most powerful and ruthless military machines ever assembled, instruments of conquest in the hands of fascists maniacs. They faced great odds and a late start , but they did not protest. They succeeded on every front. They won the war; they saved the world."